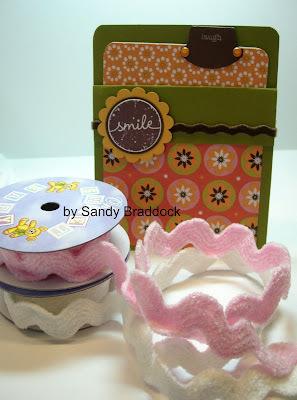 Cindy Lawrence's Sweet Candy Favor (the creative closet). Beth's Walk In The Park Card (Big Sky Paper and Design). LeAnne Pugliese's Diva Card (Wee Inklings). Lynn Put's Great Friend Swaps and Wonderful Friend Door Prize Project and Thanks A Bunch Apple Purses (The Queen's Scene). Carrie Gaskin's Oh Knit Card (Artistic Avenger). Chat's For You Card (Me, My Stamps and I). Jen Tapler's Wishing You Card (JenTapler Designs). See how your hand stamped cards can help Alzheimer's Association! Sankari's Season's Greetings Card (Sankari's Sunshine Corner). Tara's Rolodex Birthdays Project (Stampalicious). Christine's Ruffled and Inspired Tulips Card and a Spring Bouquet Card (ChristineCreations). Karen Giron's Wonderful Mother Card (the sweetest thing). crystalkbk's Thinking Of You Pears Card (crystalkbk on SCS). 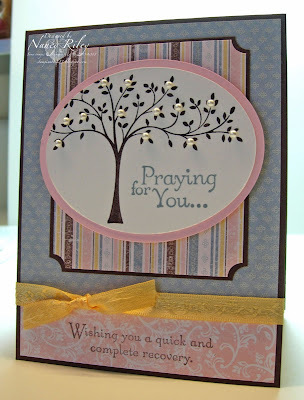 Emily Weems' Thoughts & Prayers Birthday Card (Stamping Expressions). 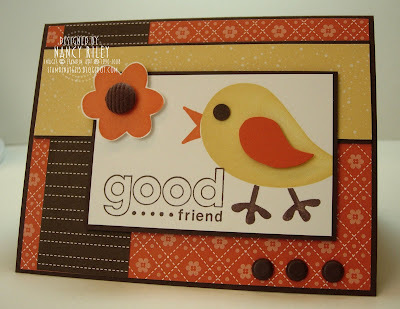 Makeesha Byl's Good Friend Card (Inkspirations). Mary Jo Albright's Pop-Up Card (beauty lies within). 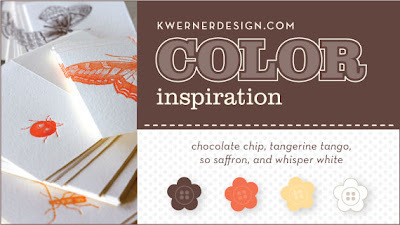 Amy Fleming's KWerner Color Challenge Card (Me & Mi Stamps). 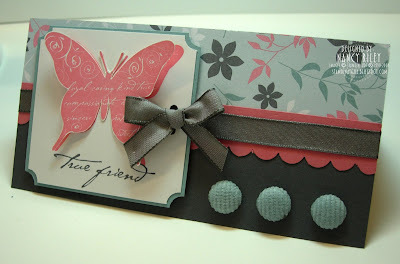 Kelly Lunceford's True Friend Card and Carte Postal Card (Flutter by Atomicbutterfly). Wednesday, April 1 starts the new Occasions Mini Catalog. This card uses a couple of new products from it ... Walk In The Park Designer Paper featuring the colors of Basic Gray, Kiwi Kiss, Cameo Coral, Baja Breeze, and So Saffron AND Baja Breeze Corduroy Buttons/Brads (they also come in Basic Gray!). I was thrilled to see a designer paper pack featuring the wonderful and almost forgotten color of Cameo Coral! I've used the wonderful Karen Giron's Sweet Sunday Sketch Challenge #11 for my card. 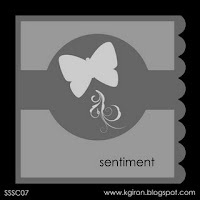 The butterfly image from Simple Friendship was stamped twice in Cameo Coral. One butterfly image was cut out and glued down the center with Tombo Mono Adhesive, allowing the wings to slightly bend up for depth. Thanks for stopping by! I'll be back this evening with iPICKS! It's been another week full of fantastic stamping projects online! Happy Weekend everybody! Last night while Allie was at a Christian concert downtown, Drew was off camping at Lake Pleasant with his bible study group, and John was into some TV shows that didn't interest me, I had a chance to tackle Kristina Werner's Color Challenge #47 of Chocolate Chip, Tangerine Tango, So Saffron and Whisper White, combined with Taylor VanBruggen's Cupcake Sketch Challenge #61. I'm not a bird fan but this little bird image is just the cutest! I did some masking to make his legs so short. His eye is simply a 1/4" Circle Punched Chocolate Chip cardstock, and his Tangerine Tango wing is cut out and popped up with Stampin' Dimensionals. Boy, have I been struggling with my mojo this week! You might have thought that I had forgotten how to stamp! Last night, it all came back to me when I went to work with this week's Sketch Challenge #221 on SCS. My daughter Allie graduates from high school in May so I need to get busy with graduation cards for her friends. 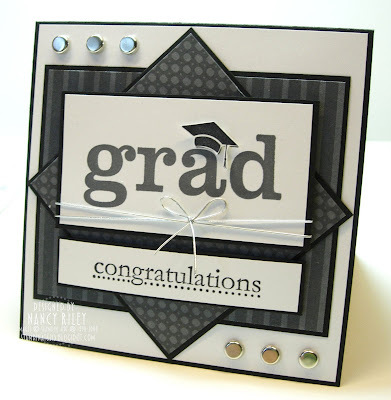 This is the first graduation card of many. 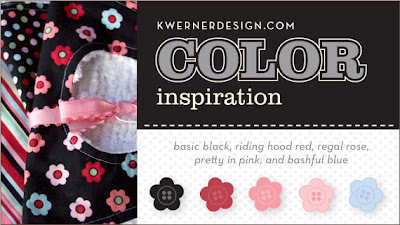 THIS CARD of mine made Kristina Werner's TOP TEN Round-Up for Color Challenge #46! (Top Ten out of 150 entries!) I was thrilled to discover this news after a long day at my day job! I'll be back in a little while with a new card design ... finally! My sixth photo in my sixth folder was this one taken about a year ago of my daughter Allie and her friend Kellie. Kellie, her mom Robbie, and I had lunch at the Italian restaurant that Allie works at. Allie was our Server that day. Honestly, I'm too tired to tag six more people ... feel free to consider yourself tagged! Goodnight! 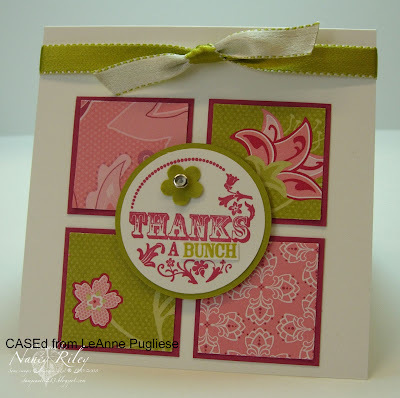 Renee's Thanks So Much Card and Cheep Talk Card (Stamping for Sanity). Jenny's Pumpkin Flower Card (Pinch of Paisley Designs). Deb Rymer's Pretty In Pink Spring Card (My Muse). Carrie Gaskin's Graduation Card (Artistic Avenger). Beate's Kiwi/Baja Butterfly Card (Fresh & Fun). Silke Ledlow's May God Bless You Card (My Life). Wendy Bond's Enjoy Card (Bond Girl Bliss). Charmaine's Happy Birthday Julie Card (Oodabug Alley). Kerin Sylvester's Mojo Monday Birthday Card (Stamps, Paper, Glitter). Michelle Yungbauer's Polka Dot Punches Card (Stamp and Smile). cvansluys Sunny Easter Wishes Card (cvansluys on SCS). MJ Albright's Woven Easter Basket (Beauty Lies Within). Mary Ann's Spring Is In The Air Card (The Joy of Stamping). 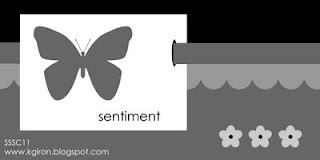 Chat's So Kind Card (Me, My Stamps and I). Vicki's Because I Care Card and Sunflower Card (It's A Stamp Thing). Mary Elliott's Sympathy Card (Everyday Elliott). 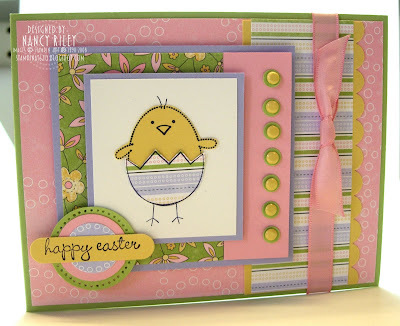 Fran Sabad's Playful Petals Scrapbook Layout and Card and Punch Bunny Egg Holder (Stampersblog). 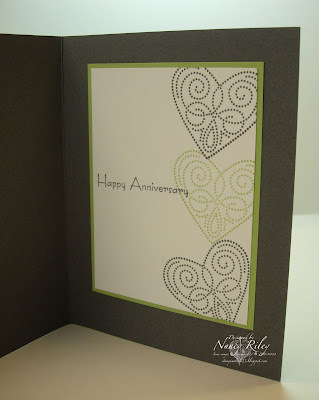 Barbara Welch's Dimensional Blooms Card (Creative Stampin' Spot). Laura Fredrickson's Branching Out Scrapbook Layout (Scrapnextras). 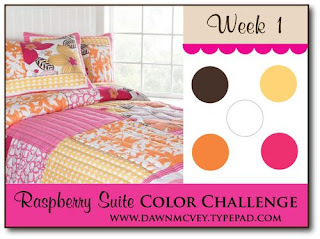 I was excited to see that Dawn McVey started hosting a color challenge on her blog, My Favorite Things. She always has the best color combos in her designs, and if Week 1 is a taste of things to come, her color challenges are sure to be very popular among the stamping community! I used Jen del Muro's Sketch For You To Try with Dawn's Week 1 Raspberry Suite Color Challenge of Chocolate Chip, So Saffron, Pumpkin Pie, Pink Passion, and Whisper White. I tried to make my design as close to the sketch as possible but struggled with the top panel/star, and ended up tying the ribbon across the width of the card. enjoy .... SPRING BREAK !!!! 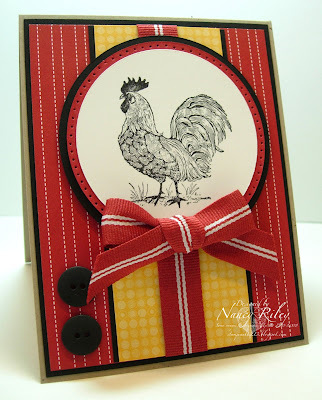 When I saw today's Color Challenge #210 of Riding Hood Red, Summer Sun, Kraft, and Basic Black on SCS I immediately thought of this stamp set, Rustic Rooster (Level Two Hostess). I'm not quite sure why I even own this stamp set ... it is so not my style! I appreciate country style and decor ... I'm just not good at creating it. This is my lame attempt at country, combined with Karen Giron's Sweet Sunday Sketch Challenge #09. Tonight was my first stamp class in a very long time. With adjusting to full time employment and recovering from foot surgery behind me, I thought my Spring Break would be a great opportunity for a comeback class! Some of my most loyal SU customers and friends were here, along with some new local friends who frequent iSTAMP! Here are the five projects we made, all of which are CASEd with minor changes. My neighbor Tammy has been away from work on sick leave with a sprained foot. She called last night to ask if she could bring goodies to class ... she was "bored" and looking for something to do. She didn't have to ask me twice! 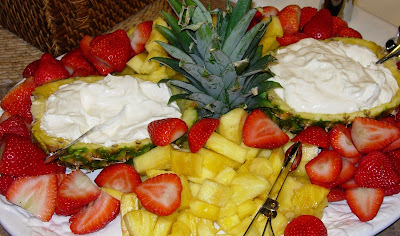 These photos show only a portion of the fabulous food she brought to stamp class! Isn't she awesome?! 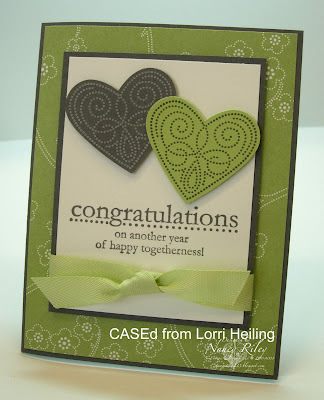 Leslie Miller's Sweet Pea Card (Running With Scissors). Tessa Wise's Friendly Flowers Cards (Crafty Girl Designs). Tracey Old's By Land Card (A Stamper's Touch). Joanne Pullen's Fifth Avenue Floral Card (studiono8). 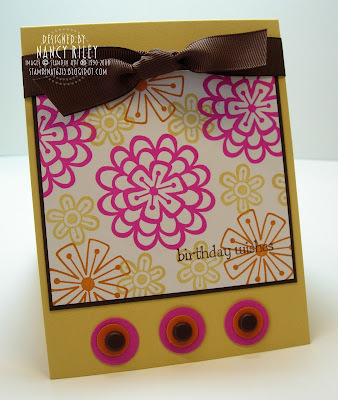 Kay Kalthoff's Blooming Card (Stamping to Share). Chat's Garden Greetings Card (Me, My Stamps, and I). Mary Fish's Branch Out In Black And White Card (Stampin' Pretty). Kelly Lunceford's Chocolate Bunnies Bag (Flutter by Atomicbutterfly). Sally Jercha's Urban Oasis Shadow Box (Sally's Stamping Creations). Anthonette Chavez' Happy Birthday, Herb Card (Chavez Designs). 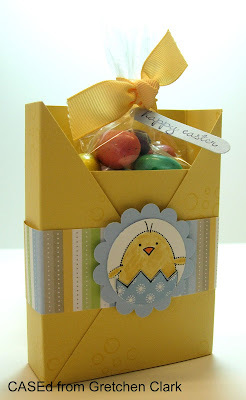 Connie Collins' Easy Woven Easter Basket (Constantly Stamping). It's been almost a week since I've posted ... or stamped for that matter. Between the day job, out-of-town company, and preparing for an upcoming class there's been no time for stamping or blogging. I spent most of yesterday cutting paper for Monday's stamp class, and got to stamp a little last night. Boy, was I rusty! It took me forever to get this design to come together! I used Jen del Muro's Sketch For You To Try, Thoughts and Prayers and Bella Birds DP. I wonder why they named this designer paper Bella Birds, anyway?! 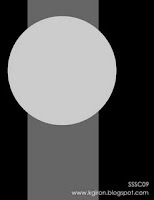 There's not a single bird in the design! I hope to be stamping and posting again regularly after Monday's stamp class, as I am on Spring Break this week! woohoo! I'll also be back tonight with another selection of iPICKS! 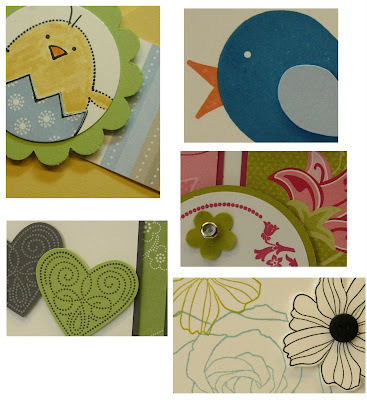 Here's a sneak peek at the five projects I have planned for my upcoming Stamp Class on Monday, March 16 at 6:30. If you are in or around the Phoenix, Arizona metro area and would like to attend, please contact me for details at nrileycm@cox.net. Space is limited. Carrie Gaskin's Come Fly with Me Card (Artisitc Avenger). Caroline Colgan's Ahoy Matey Cards (Caroline's Stamp Pad). Lori Kalus' So Blessed Card (Afternoon's Delight). Michelle Yungbauer's A Good Egg... "Sun" Fun Card (Stamp and Smile). Kimberly Gajewski's Happy Heart Day Card (It's So Pretty! It's So Cute!). Kristen's Just Because Card (Sunshine, Smiles & Stamps=Lovin' Life). Kelly Lunceford's Rockability Pirate Card (Fluttery by Atomicbutterfly). Mercedes' Yummy Sale-A-Bration Project (Share~Inspire~Create~). Amy Ward's Trendy Trees Card (Amy's Addiction). Kendra's 5th Avenue Floral Card (The Dog Ate My Stamps). Jessica Rone's Limited Florals Card, Here For You Card, and Flowers of Happiness Card (Can you say????? ... Addicted to Stamps?). Silke Ledlow's Purse and Coordinating Cards and Doodle This Card (My Life). Dawn's Fifth Avenue Floral Card (Dawn's Stamping Thoughts). 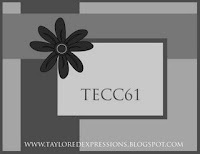 Taylor VanBruggen's Spring Flowers Card (Taylored Expressions). It's been a busy week - the reason for my lack of original artwork. Next week looks to be much of the same with out-of-town guests and stamp class preparation, but hope to get a little creative time this weekend. I do however find it necessary to provide a gentle reminder to my readers. Ya' all know how much I love to stamp, and how much I love to share my creations with you. I am extremely flattered when my original artwork is CASEd (Copy And Steal/Share Everything). Lately, I've been coming across my artwork CASEd on other blogs without any mention of the original artist. Please respect my time and creativity by clarifying that it is a CASE, mentioning my name along with a link to my blog. 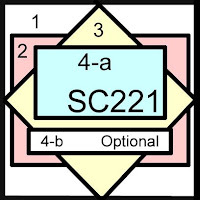 I encourage you to CASE my creations and post them on your blog or SCS (for personal use). 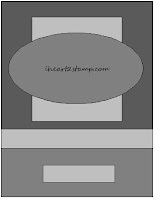 All I ask is that you mention me as the original artist, along with a link to iSTAMP - it is proper stamping/blogging etiquette. I'm off to bed ... I get to sleep in tomorrow! woohoo! 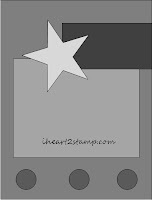 I finally got around to playing with some of the new Stampin' Up! Specialty Designer Papers! I love these cover-weight, textured papers! This card uses Parisian Breeze and the Level Two Hostess stamp set A Little Somethin' with Karen Giron's Sweet Sunday Sketch Challenge #7. Dawn Olchefske's Wedding Money Holder (DOstamping with Dawn). Lynn Put's Sunflower Get Well Card (The Queen's Scene). Renee's Cheep Talk Congrats Card (Stamping for Sanity). Vicki's Grungy Sketch Card (It's a Stamp Thing). 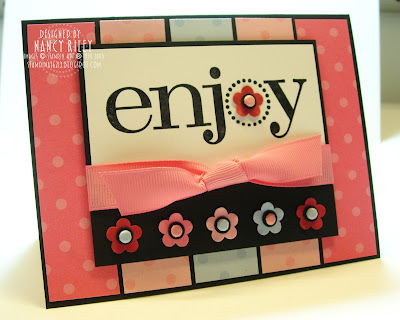 Mary Fish's Criss Cross Recipe Card (Stampin' Pretty). Amy Rohl's Birthday Hugs for Mom Card (Ink About Me). 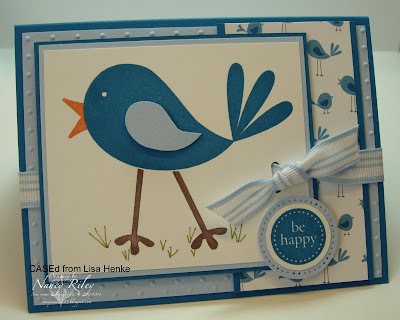 Lynn Weiss' Cheep Talk Card (LW Designs). Jan Tink's Sweet Slumber Sailboat Card (Stamps, Paper, Scissors). Kirsten DuBosque's Getting There Is Half The Fun Card (Confessions of a Naptime Stamper). Angie Tieman's Scallop Envelope Treat Holder (schwooo!). Silke Ledlow's Thinking Of You Card (My Life). Mary Ann's Criss Cross Box (The Joy of Stamping). Amy Sheffer's Viva La Verve Card (Pickled Paper Designs). Tessa Wise's Cute Little Love Birds Card (Crafty Girl Designs). Julee Tilman's Viva la Buttons Card (Poetic Artistry). Megan's Note Card Holder (Well Dunn Ideas). Michelle Yungbauer's Thoughts and Prayers Card and Thinking of You Card (Stamp and Smile). 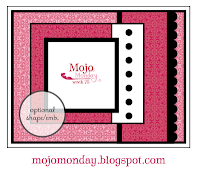 Wendy Janson's Mojo 75 Card (It's All About Stamping!). Mothermark's Pink Poodle Card (This is My Story). Jackie Pedro's Simple Friendship Card (The Scalloped Edge). Gretchen Barron's Tart & Tangy Rockability Card (Inspiration In Action). I've had this design in my head since I first saw Julee Tilman's Mojo Monday Sketch #75 earlier this week. 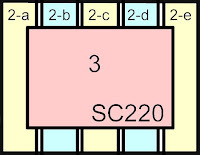 This is my kind of sketch with all the fun and interesting layers, the row of brads, and scallop border! I couldn't WAIT to create it! Now that it's completed, I'm quite pleased (you don't hear me say THAT very often, do you?!). I combined the stamp set, A Good Egg with the new Tea Party Designer Paper. * The paper piercing on the Certainly Celery 1 1/4" Circle behind the sentiment was created with the Priceless Classy Brass Template.